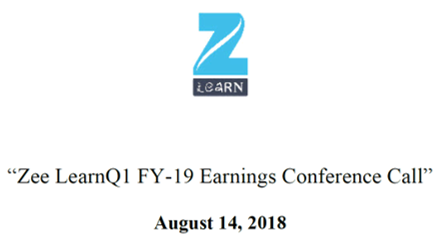 Zee Learn in the last 10 to 12 quarters has consistently performed well, and the growths have been to the extent of about 35 to 30% both on the top line and bottom line. Zee Learn has approximately 200 business partners as franchises. Mahesh Tutorial in this first quarter have done a breakeven and posted a small PAT of about approximately a Crore. The company has acquired 60% and immediately as on date there are no plans to merge MT Educare. The company attributes it’s increased the margin during the quarter to disciplined executions, accelerating growth and strong leadership bandwidth. The company is confident that its persistent focus on the operational efficacy of the newly acquired business of MT Educare will continue. Company’s top line at the console level including MT stands at Rs. 113 crores which are up by 67&. Company’s EBITDA is at Rs.42 crores vis-à-vis Rs.26 crores for the same period last year which is up by 62%. Company’s EBITDA margin is at 37% vis-à-vis 38%. We have managed to maintain the margin in spite of MT consolidations. Company’s PBT is at Rs.34 crores vis-à-vis Rs.19 crores for the same period of last year up by 77%. Company’s PAT is at Rs.24 crores versus Rs.12.8 crores of the same period of last year up by 87%. Company’s PAT margin is up by 21% vis-à-vis 19% for the same period. Company’s minority interest is Rs.2.4 cross, and PAT stands at Rs.21.6 crores vis-à-vis Rs.12.8 crores which are up by 68%. Company’s top line is at Rs.82.9 crores vis-à-vis Rs.66.9 crores which are up by 24%. Company’s EBITDA is at Rs.31.9 crores vis-à-vis Rs.25.1 crores which are up by 27%. Company’s PBT is at Rs.25.8 Cr vis-à-vis Rs.19.3 crores which are up by 34%. Company’s PAT is at Rs.18 crores versus Rs.12.8 crores which are up by 41%. Company’s PAT margin is at 22% against 19% for the same period of last year. 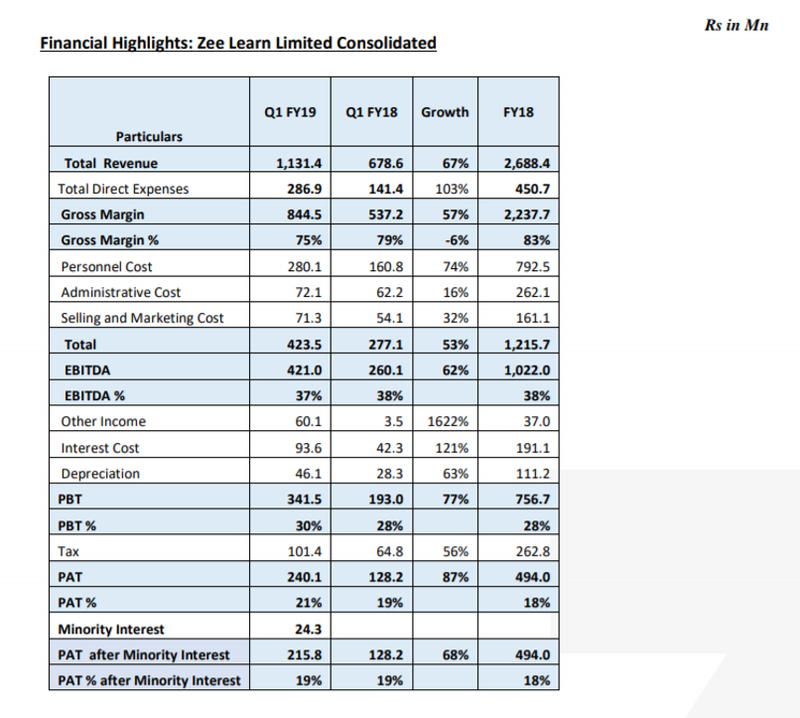 Zee Learn’s top line standalone stands at Rs.54.2 crores versus 51.7 crores which are up by 5%. Company during the same quarter last year had a one-time revenue of around Rs.3.12 crores on account of sale of additional kits. Company’s growth at a standalone level after excluding the past year’s quarter one-time revenue comes to around 12% which is in line with its normal growth. Company’s standalone EBITDA stands at Rs.22.9 crores versus Rs.18.9 crores which are up by 21%. Company’s EBITDA margin is 42% vis-à-vis 37% and on a standalone basis. Company’s PBT is Rs.23.6 crores vis-à-vis Rs.17.9 crores which are up by 32%. Company’s PAT at Rs.16.2 crores vis-à-vis Rs.11.6 crores which are up by 40%. Company’s PAT margins stood at 30% versus 22% in the period during last year. The company has Rs.16 Crores at Zee standalone level versus the same period last year we had Rs.14 crores debtors. As far as DVPL is concerned the debtors has reduced to Rs.14 crores versus Rs.51 crores the same period last year. The net debtors at MT are at about Rs.21 crores versus Rs.137 crores last year same quarter, so the company is very well placed regarding the receivables. The company has about Rs.118 crores borrowings at ZEE Learn standalone versus Rs.108 crores same quarter last year. The company has Rs.122 crores at DVPL versus Rs. 121 crores same quarter last year and MT borrowings as on June stand at Rs.154 crores versus Rs.161 crores. MTS started repaying their borrowings post-June, and there is a substantial reduction as of now. Kidzee revenue has grown by 5% however when that one-time sale of kit during last year same quarter the Kidzee has grown up by about 12%. Kidzee’s EBITDA margin was about 50% vis-à-vis around 47% same quarter last year. Kidzee’s EBITDA is about Rs.21 crores versus Rs.18 crores last year. Kidzee has about 1,10,000 students versus 102,000 students same period last year. So, there is a growth of about 8%. The company expects to reach about 145,000 and a little above 145,000 students by the end of the financial year. MT operates on self-operated models. Their centers which are there are mostly self-operated. Mahesh Tutorial’s geographical spread is limited to 7 or 8 states. The company sees an opportunity for MT to expand Pan India via ZEE Learn’s Kidzee and Mount Litera schools that operate in 700 to 750 cities pan India. Mahesh Tutorial can become a partner of about 200 franchises of Zee Learn and utilize their real estate. Zee Learn students would have access to very good content curriculum, of the higher classes specifically 9th 10th and 11th and 12th from the Mahesh Tutorial portfolio. The company has to put a lot of efforts to acquire the consumers who come to Kidzee at the age of 2 years. The company acquires and nurture them for the next 15 odd years. MT Educare has enrolled about 46,500 students through its various verticals in this quarter, versus about 35,400 students they served during the same quarter last year. The company had cleared about Rs.51 crores of debt for MT Educare which were standing around 176 crores when we acquired MT Educare. Company’s target is to reduce the debts in the MT Educare substantially and thereby save the interest cost. The company revealed that the reduction in debt is also connected with the one-time payments that will be required to do as per the term sheet entered by MT Educare. The company had infused 200 crores in MT Educare and by that time they had about 176 crores debts. The Company aims to utilize that 200 crores substantially or largely to reduce the debt, to use about 15 crores to 20 crores in working capital. Mount Litera Zee School has about Rs.10 crores top line versus Rs.10 crores top line last year. Mount Litera last year had two signups higher than the current year signup. Mount Litera normally does around 15 signups during the year. The EBITDA margin for Mount Litera franchisee business stands at 30% versus 26% last year. Liberium has delivered a turnover of Rs.19.6 crores versus Rs.9.4 crores, growth of about 108%. Liberium currently is served by 3900 employees versus 2000 during the last year same period. Liberium's EBITDA margin is about 5%, and PAT margin is about 3.6%. The company plans to roll this out in 100 centers in the current year. Kidzee Day Care’s theme is home away from home which provides the safe, secure and nursing environment for every child. Kidzee Day Care is a comprehensive program hearing cognitive, social and emotional, combination of speech, language, sight and gross motor skill development for the child. The company plans to start this pilot in the month of October. The company expects a significant impact regarding revenue from these 100 centers. The company plans to do a pilot across 50 such locations across the country. Ankuram is aimed at providing structured quality education at an affordable cost in a safe and secure environment. The company wants to give students the best chance of academic success by providing well-researched age appropriate and child-centered holistic curriculum. The company has already done three signups so far, one in Udaipura which is in MP, Jamner in Maharashtra and Shahapur in Karnataka. The company plans to do a launch in September with around 10 to 15 schools. The company has also taken small steps into the smart classes space ICD space and the objective being to identify stable government projects with a sustainable margin. Company’s academic strength, Pedagogy, school management experiences give it the competitive edge. The company so far has not ventured into this field, and this is the first time they plan to enter. The company has already formed a partnership with –another entity Edu Solutions. The company has got its first project which is the Agra smart city; it is a very small project with 30 digital classrooms for an order value of about 52 lakhs. The company has few projects in the in the pipelines they are already in talks at Dharamshala, Telangana, Jammu and Kashmir and Jharkhand for similar projects. The company has planned to make the Kidzee Learning Tab a mandatory part of the student kit as it would be linked to their curriculum, therefore providing better learning outcomes for the child. The company mentions it as a cheaper option compared to what they had provided previously. The company finds the tab to be convenient also, as it can be installed on any Android or IOS platform. The company plans to start from the next academic year, and they are targeting 50,000 plus children in the pilot itself. The company believes that obesity is a real problem amongst children in India and therefore they plan to roll out a wellness program across our children both in Kidzee as well MLZS. The company has been a pioneer in early child education, and this initiative is spreading the awareness about health and nutrition. The company expects it to be a significant revenue driver for it because given the scale and the scope. The company will be covering four broad parameters-general, dental, eye and dietary. The company has received a very positive response and these have to be assessed by qualified doctors we are starting off with the pilot with 50 centers covering 5000 children’s in September and so far we have received a very encouraging response. The company is also launching a parenting magazine for the network for the first time. The company believes that it is very important to also communicate effectively with the parent community. The company wants to deliver uniform; it is starting with uniforms with online delivery of uniforms across the network. The company conventionally use to bring all material into its warehouse and then dispatch it to the respective schools, but here they want to go directly to the parents. The company expects significant operational efficiencies benefits both regarding top line and bottom line as they go forward on this. Robomate is online App; it is delivered to its customers in two formats, Whoever buys a test prep or tutorial package gets access to Robomate and secondly one can also buy it in a standalone mode directly. Robomate is a SaaS-based platform which is very versatile. Robomate is not only a tool for delivering content curriculum, etc., to the students, but it is also testing, self-assessment revision tool, and also the same tool can be used to manage the various activities within an educational institution. The company expects the performance metrics for the direct part to be, that how many people have registered on the web portal for this particular app. Secondly, how many have done a download of the free trial which is offered for 3 or 4 days. And then how many have bought it? The company will provide Robomate app to the students who buys a test paper or tutorial course from Mahesh Tutorial. The company would have B2B tie-ups for the Robomate with many institutions. The company generates two types of revenues from Robomate; one through the tutorials and the test prep that MT conducts through its class rooms. There is an apportionment of Robomate which is offered to those students which will be about 25% to 30% of this fees that they pay for each of those tutorials and the test preps. The company also sell robot mate as an independent package to students outside its classrooms. Company’s sales value for outside students is roughly around 10,000 to 12,000 per user. The company is confident about the larger acceptance of Robomate. The company has sold about 9750 Robomate outside the classrooms to the independent students, which were not MT Educare students versus 2473 students done in the same quarter last year. The company has so far generated five crores from Robomate.